In the intervening years, his professional life as a Naval Officer took him all over the world. He was stationed twice in Italy (Naples and Rome), Munich (Germany), Japan and the Philippines. During these assignments, he and his wife, Patricia, were able to travel extensively while raising two children. Tory was able to combine coin collecting with visiting the ancient historical sites where the coins were used. After retiring from the Navy, Tory spent 15 years as a consultant to the federal government and international private sector firms. This provided an excellent opportunity to continue to travel, visit ancient sites and museums and collect coins. As part of his work he was a frequent guest lecturer on environmental issues and remote sensing. In 2003, Tory and Patricia started work on their home, a reproduction of Thomas Jefferson’s private house called Poplar Forest. This federal style house proved to be a real challenge as they combined period architectural elements (doors, windows, flooring hardware, etc.) with modern building techniques (insulated concrete forms, recycled car tire roofing tiles, and radiant floor heating). Roman coin collectors will note that the dining room has a copy of the mural from Empress Livia’s house contributing to the ancient Roman feel of the house. During the summer of 2006, Tory worked closely with Dr. Brent Upchurch and others to make the Coins of Constantine Symposium in York, England a great success. Tory currently works full-time for Patricia and her Architectural Old House Parts business. He also works part time as a consultant and has several ongoing writing projects in the works. He holds a Master of Arts in International Relations from Boston University and a Bachelor of Arts in History from Southern Methodist University (SMU). He speaks both Italian and German and serves on the board of directors of several non-profit organizations. Tory's collection was carefully assembled for rare and unusual types as well as common high grade examples. He had an excellent eye for rarity and was able to add many seldom seen and even unique coins to his collection. Tory bought coins from many US and European dealers, many with provenances to other collections. Three major collections are well represented in his collection, The Bavarian Collection, The Switz Collection and the Vienna Collection. Tory wrote an article about the The Bavarian Collection that was published in The Celator in January of 1994. Clicking on the Bavarian Collection will allow you to read the article. 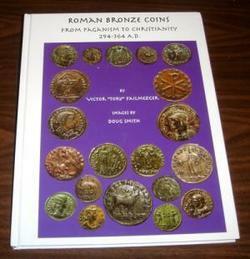 Roman Bronze Coins: From Paganism to Christianity 294-364 A.D.